Start The plowed loading zone on the north side of Interstate 80 at the Castle Peak Area and Boreal Ridge exit. Parking is at the Donner Pass Sno-Park located at the east end of the frontage road on the south side of the interstate at the same exit. This loop offers a visit to the west side of Andesite Ridge as well as Castle Pass and Castle Valley to the east of the ridge. An ascent of Andesite Peak adds a climb of 0.3 mile and 200 feet. If you want to "see it all in one trip" you can also add a side trip to Round Valley and Peter Grubb Hut making it a full day of skiing. This tour is described in a clockwise direction because navigation is a tad easier. The result is that you descend Castle Valley which is often tracked out by the hoards of skiers and snowshoers that visit it. A rutted descent can be tricky. From the trailhead (1) ski east on the snow-covered road that parallels the interstate and then northwest for a total of 0.3 mile until you reach a road junction (2). The road continuing northwest (straight) leads to Castle Valley, which is closed to snowmobile use, while this tour follows the road to the west (left). Turn west (left) and ski west and then northwest on the road for a total of 0.7 mile until you reach a meadow (3). You may see a road junction shortly after beginning this section; take the north (right) fork if you do. Just before reaching the meadow you pass a gently sloping, open area to the northeast (right) that is ideal for playing and practicing technique. 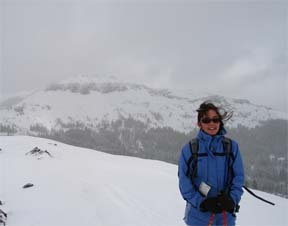 Ski northwest for 0.9 mile until you reach the west ridge of Andesite Peak (4). Don't expect to see any roads in this area except where they form corridors through trees. Only follow a road if it goes in the correct direction and if you see a road junction always take the north or east (right) fork. Climb east up the west ridge of Andesite Peak for 0.1 mile until you reach a location where the terrain is more level (5). From this point it is 0.3 mile and another 200 feet of elevation gain to the summit of the peak. Ski slightly east of north and parallel to the ridge of which Andesite Peak is a part for 0.7 mile until you reach Castle Pass (6). An old road passes through here and makes travel through the trees easier. The road ends before reaching Castle Pass. Descend southeast from Castle Pass for 0.1 mile until you reach a more level terrain (7). Descend to the southeast on a road and marked trail for 1.4 miles until you reach the road junction (2) that you encountered earlier in the tour. The road you are descending can be difficult to recognize, and the trail markers are far apart due to the sparse vegetation. However, it is hard to go wrong if you simply parallel Andesite Ridge. Retrace the initial route for 0.3 mile back to the trailhead (1).